We have arrived in Tonga and have been re-acquainted with many friends of the past couple of years and even more tsunami stories. When I was a kid we used to call these tidal waves. Everyone is quick to point out they aren’t related to tides and should therefore be called ‘tsunami’. Since ‘Tsunami’ is Japanese for ‘Harbor Wave’ I don’t think it’s any better – a tsunami is a wave practically undetectable out in deep water and only becomes a wave as it approaches shore. Since it becomes apparent in a harbor or tidal zone it seems like either name should work, but we’ll stick with ‘tsunami’. Additionally, boats on anchor around where we are now had a few scary stories, mostly smaller surges that caused temporary groundings and heart stopping moments while trying to get things back under control. We saw our friends Rob and Marjo of the Dutch sailboat ‘Taremaro’ along with Heinz and Silvia of the Austrian sailboat ‘Gallathe’ who were both in Niutoputapu, Tonga. 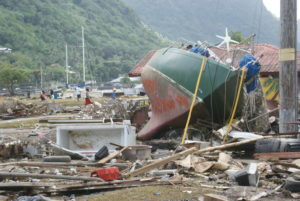 Niutoputapu was the hardest hit area of Tonga with 90% of the town wiped out by a tsunami. Fortunately they were leaving early to head to Vava’u, ‘Taremaro’ was in the pass leaving the harbor when the earthquake struck, ‘Gallathe’ was raising their anchor. Both boats made it to deeper water. After ‘Gallathe’ went through the pass they looked back and watched the harbor drain of water to the point the pass they had just left through was high and dry! 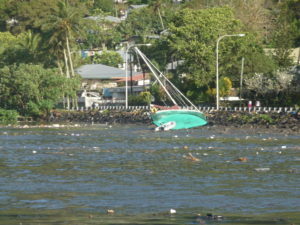 The inrush of water pushed both boats back toward shore but they were able to overcome the current and stay offshore. When the wave entered the harbor the sailboat ‘Happy Spirit’ hadn’t made it out the pass before it went dry. As a fifteen foot wave approached across the harbor they were heard on the VHF saying they were going to lose the boat. Fortunately, the wave didn’t break or drive them back toward the beach. They were able to ride over the wave, escape, and are now happily on a mooring here in Vava’u. 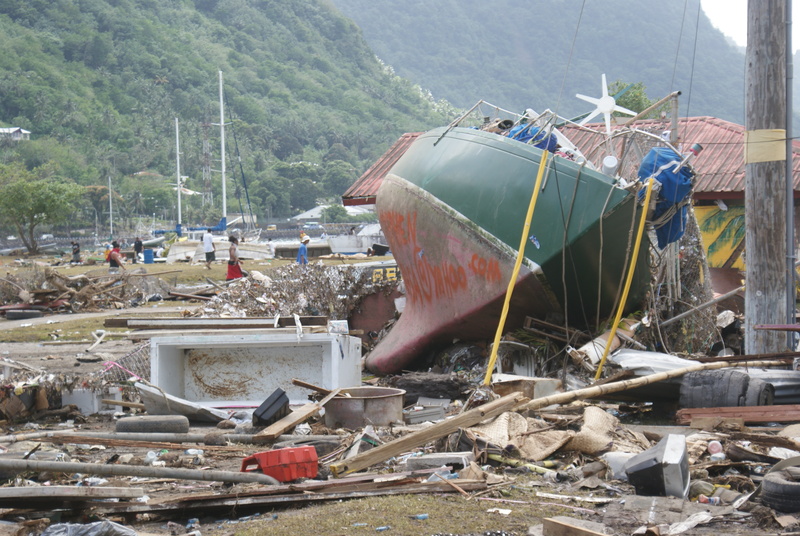 The saddest tsunami report for us personally is of Dan on Mainly, who was swept away trying to free his boat from the wharf in Pago Pago. Joan, his wife, was able to motor the boat to deeper water until it was safe to return to the wharf. Ironic that both Joan and the boat were unscathed. Sad that she discovered his body when they brought it to the morgue at the local hospital. Sad. And of course, we shouldn’t forget that over 130 other people who lost their lives, mostly due to the tsunami. No matter how much time, energy, and money we spend preparing for our adventures, securing our homes, and protecting our loved ones, it is humbling to find it all overcome in a heart beat by a simple act of nature. The devastation and havoc from one earthquake is staggering, the human toll unfathomable.